Yishuv refers to the Jewish community in Palestine. The British Mandate period was from 1922 to 1948. This post continues from the same reference (Nur Masalha’s Expulsion of the Palestinians) as in my previous post, and looks at a Palestinian historian’s discussion of the fate of the Palestinian people as planned by the Zionist movement from “the beginning”. Some readers may accuse me of stirring up hatred against the Jews by posting this sort of research. I deny any such charge. The ill-feeling and tensions that have resulted from the events and attitudes described in this and in the previous post don’t have to be “stirred up”. But many people in the West certainly do need to be “waked up” to the other side of the story. Obscenely, one is often accused of “anti-semitism” for even daring to raise the Palestinian voice, or even any voice mildly critical of Zionist or Israeli state policies. The world, and Palestinians and Israelis in particular, are living today with the legacy of the past. Justice, the precondition for peace, can only emerge after all the facts — from both parties — are laid out for all to see. Hiding one side’s story under the rocks of the desert will never extinguish injustice and hatred. We have lauded Truth and Reconciliation Commissions and National Apologies in cases of other ethnic horror stories. They could never have happened unless both sides — especially that of the defeated — were fully aired. 1917 = 10% of population; own 2% of the land. Growing Arab awareness of Zionist aims in Palestine, reinforced by Zionist calls for unrestricted Jewish immigration and unhindered transfer of Arab lands to exclusive Jewish control, triggered escalating protests and resistance that were eventually to culminate in the peasant-based great Arab Rebellion of 1936-39.
but on the other hand it was becoming increasingly clear that the Palestinian Arab population were intent on keeping their land. Predictable result: early 1920s saw the first indigenous demonstrations against Jewish immigration. The Balfour Declaration had not only promised a national home for the Jews; it had also promised that the Palestinian Arabs would not lose any of their rights as a result. His Majesty’s Government view with favour the establishment in Palestine of a national home for the Jewish people, and will use their best endeavours to facilitate the achievement of this object, it being clearly understood that nothing shall be done which may prejudice the civil and religious rights of existing non-Jewish communities in Palestine . . .
there are the Jews, whom we are pledged to introduce into Palestine, and who take it for granted that the local population will be cleared out to suit their convenience. 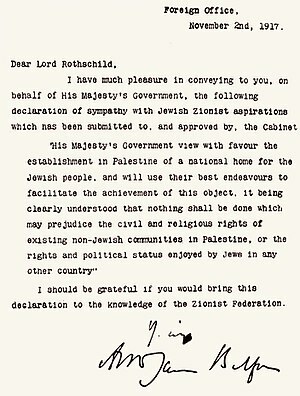 Lord Boothby, president of the British-Israel Association and Zionist, publicly insisted that a letter sent to him by Mrs Weizmann supported his recollection that the original draft Balfour Declaration had “made provision for the Arabs to be removed elsewhere, more or less.” This claim was, according to Masalha’s cited reference (Yosef Nedava, “British Plans for the Resettlement of Palestinian Arabs” (Hebrew), Haumah, no. 89 (Winter 1987 / 88). p. 132), supported by Boris Guriel, a senior official in the Weizmann archives, Rehovot. … the Arabs had read my article in Pearson’s Magazine, in which I pointed out the difficulty in the existence of the Arab population in the Land of Israel . . . and this caused much agitation among them. Now the Zionists asked me not to raise the question and I agreed for the time being. avoiding all mention of the Arab question in party manifestos and policy statements. to seek — both with the British government and with Arab leaders — a solution outside Palestine within the wider framework of the Arab countries. And the root of this notion . . . . This explains Chaim Weizmann assessment. . .
Indicative of David Ben-Gurion’s disdain of Arab culture is his failure to learn ‘the language of the people among whom he lived for almost his entire life’, despite having had an obvious aptitude for languages, having learned (in addition to his native Yiddish-Hebrew) Turkish, English, Russian, French, German, Spanish and ancient Greek. Thus from the beginning the Zionist enterprise has been undertaken by leaders with little regard for Arab culture, and who have failed to acknowledge among the Palestinian Arabs any distinct identity or semblance of nationalism. There were a few times when Zionist leaders did in fact recognize a certain national character or distinct sense of group identity among the Palestinians in their opposition to Zionism. Another was during the Great Arab Rebellion 1936-1939, marked by prolonged strikes and fighting. The debate as to whether or not an Arab national movement exists is a pointless verbal exercise: the main thing for us is that the movement attracts the masses. We do not regard it as a resurgence movement and its moral worth is dubious. But politically speaking it is a national movement…. The Arab must not and cannot be a Zionist. He could never wish the Jews to become a majority. This is the true antagonism between us and the Arabs. We both want to be the majority. …the fear is not of losing land, but of losing the homeland of the Arab people, which others want to turn into the homeland of the Jewish people. The Arab is fighting a war that cannot be ignored. He goes out on strike, he is killed, he makes great sacrifices. Ben-Gurion even said (in a letter to Shertok, 24 July, 1937) that if he were a politically conscious Arab he, too, would protest Jewish immigration that was proceeding at such a pace (60,000 a year) as to ensure a Jewish state in all of Palestine. But generally when Palestinian nationalism was acknowledged by Zionist leaders, it was usually to compare it to German Nazism. 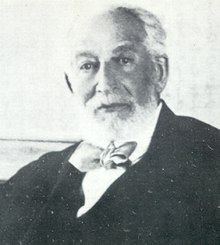 Yitzhak Tabenkin in his 1936 May Day speech described the Palestinian national movement as a “Nazi” movement, with which there was no possibility of compromise. Since the Zionist leaders viewed the Palestinians as nonexistent as a nation and not an integral part of Palestine, they were able in their own minds to subsume the Palestinian “Arab problem” beneath the broader Arab nationalist movement then spreading throughout the Arab world. If Palestinian Arabs could be thought of as “only Arabs” without any sense of attachment to their own homes and lands, they could (according to Zionist leaders) be considered as merely a local part of a much larger body of Arabs. Thus the Zionist leadership felt quite justified in dealing over the heads of the Palestinian Arabs by discussing their fate with other Arab leaders from the start. There is a fundamental and decisive difference between the situation of the Arabs as a nation and that of the Jews as a nation. Palestine is not needed by the Arabs from the national point of view. They are bound to other centres. There, in Syria, in Iraq, in the Arabian Peninsula lies the homeland of the Arab people. There is no answer to this question nor can there be, and we are not obliged to provide it because we are not responsible for the fact that a particular individual man was born in a certain place, and not several kilometres away from there. Jerusalem is not the same thing to the Arabs as it is to the Jews. The Arab people inhabits many great lands. This was said during the 1929 Arab-Jewish riots over changing the status quo with regard to praying rights at Jerusalem’s holy places. Zionist transfer plans for the Palestinian Arabs throughout the 1930s and 1940s were based on the belief that Palestinian Arabs should be subsumed in the larger Arab world. In other words, to counter Arab nationalism regarding Palestine, Zionist leaders had the contradictory idea that Palestinian Arab nationalism could be somehow “detached” from Arab nationalism generally, and that Arab nationalism could somehow subsume the Palestinian Arabs. Despite pan-Arab opposition to Zionist colonization in Palestine, Zionist leaders still felt they could deal with Arab leaders to effect the transfer of the Palestinian Arabs. To see evidence of this contradiction working out in today’s (July, 2010’s) developments in, for example, Jordan, see Robert Fisk’s analysis of the Arab nationalist movement in Jordan responding to Palestinian incursions. Zionist deals with Arab leaders generally consisted of offering finance, expertise, or international influence in exchange for acquiescence in expansion of Jewish settlements in Palestine, and later, for absorbing the anticipated Palestinian transferees. A prototype of this arrangement happened in January 1919, between Chaim Weizmann and the Hashemite Emir Faisal. 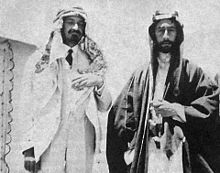 In exchange for Faisal’s acceptance of Jewish immigration into Palestine (as per the Balfour Declaration), the Zionist Organization would provide economic experts to Faisal’s hoped-for new kingdom. See http://en.wikipedia.org/wiki/Faisal_I_of_Iraq#Post_World_War_I for an extract of Faisal’s diplomatic announcement of this agreement. Transfer is not mentioned in this particular agreement, but the principle was set: Arab acquiescence in Zionist goals in exchange for Zionist assistance. He [Rothschild] advised me to carry on in similar activities, but it is better, he said, not to transfer the Arabs to Syria and Transjordan, as these are part of the Land of Israel, but to Mesopotamia (Iraq). He added that in these cases he would be ready to send the Arabs, at his expense, new agricultural machines and agricultural advisers. While Zionist leaders sought for solutions to the “Arab problem” within the wider Arab framework, at the same time they were taking concrete steps on the ground in order to facilitate any broader agreement that might be reached. 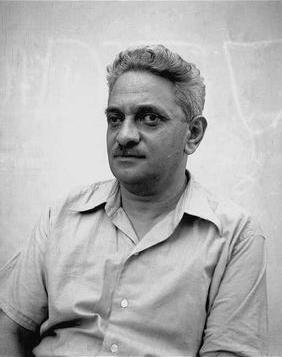 Ben-Gurion reported that Alami voiced apprehensions regarding the fate of the Palestinians in the Jewish state. Since they were farmers, they would be dispossessed, with nothing to do. Ben-Gurion replied that Zionist policy was to avoid a South African situation where one race were the owners and rulers, and another the workers. Thus Jewish employment could be assured; Arab employment would find new opportunities as a consequence of Zionist colonization and expansion, not only in Palestine, but throughout the Arab federation. Palestinian Arabs were thus assured to “benefit” while being encouraged to look for employment created by Zionist enterprise and to seek residency (euphemism for transfer) to another Arab country such as Iraq. These were the terms used by the Zionists themselves to refer to their alternatives for making Palestine an all-Jewish state. They spoke of redemption of “Hebrew Land” and “Hebrew Labor”, mean the acquisition of the land occupied and farmed by Palestinian Arabs for exclusive Jewish ownership, use and employment. The transfer issue was raised two weeks later at a meeting of the Jewish Agency Executive. These doctrines had early roots in the Zionist movement. 1901: The Jewish National Fund was established as the body for the Zionist Organization and Jewish Agency for the purpose of acquiring and administering land in Palestine. Any land it acquired was to be held in perpetual trust for the Jewish people. Non-Jewish labor was not allowed on it. The Wailing Wall riots (1929) — led to the intensified struggle to enforce the doctrine of Hebrew Labor. Histadrut (federation of Jewish Labor) launched a campaign to physically remove Arab workers employed in Zionist industries in cities. At this time Jewish society was mobilized to picket Jewish-owned citrus groves that employed Arab labor. I remember being one of the first of our comrades [of the Ahdut Ha’avodah] to go to London after the First World War…. There I became a socialist…. 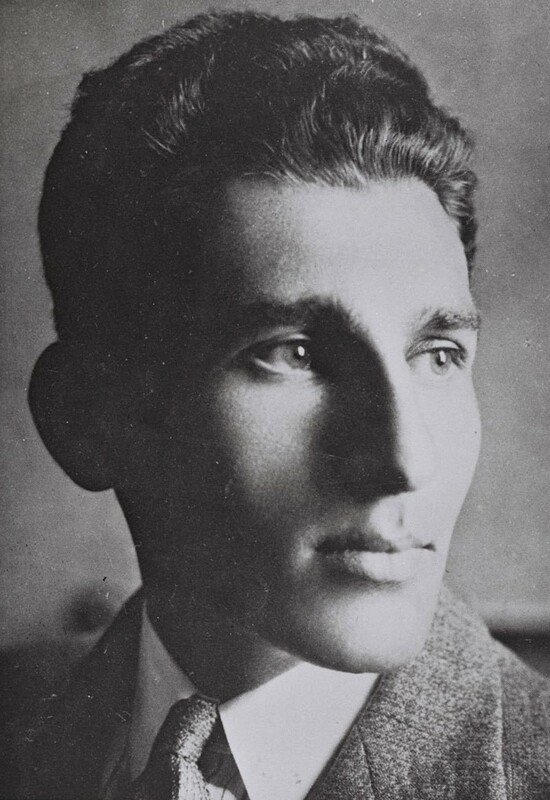 [in Palestine] I had to fight my friends on the issue of Jewish socialism, to defend the fact that I would not accept Arabs in my trade union, the Histadrut; to defend preaching to housewives that they not buy at Arab stores; to prevent Arab workers from getting jobs there…. To pour kerosene on Arab tomatoes; to attack Jewish housewives in the markets and smash the Arab eggs they had bought; to praise to the skies the Kereen Kayemet [Jewish National Fund] that sent Hankin to Beirut to buy land from absentee effendi [landlords] and to throw the fellahin [peasants] off the land — to buy dozens of dunams — from an Arab is permitted, but to sell, God forbid, one Jewish dunam to an Arab is prohibited. The 1936-39 Palestinian rebellion was the pretext for the Zionist leadership (headed by Ben-Gurion’s Mapai party) to strengthen and expand the Yishnuv’s military wing, the Haganah. …there is no chance of an understanding with the Arabs unless we first reach an understanding with the English, by which we will become a preponderant force in Palestine. What can drive the Arabs to a mutual understanding with us? …. Facts…. only after we manage to establish a great Jewish fact in this country…only then will the precondition for discussion with the Arabs be met. By the summer of 1937 the Haganah had prepared a military plan [the Avner Plan] for the conquest of Palestine in three stages, with the exception of the Negev, south of Beersheba. as an attempt to expel the Arabs from Palestine. This public concern was declared at the same time he (Weizmann) was actively promoting his plan for transferring the Arabs to neighbouring states (see above). In 1931 the Zionists decided to endorse, under British pressure, the plan for a “parity” representative legislative council — Jews at the time constituted only 17% of the population and would be so represented in the council. Ben-Gurion’s public slogan since the 1920’s, “not to rule and not to be ruled in Eretz Yisrael” was belied in the 1930s by his other actions and statements, and shown to be a mere public relations slogan. The main differences between the many Zionist groups regarding the “Arab problem” were largely “tactical, rhetorical and stylistic”. The basic assumptions for the need for Arab removal were the same. There were a few exceptions. A number of Jewish groups did indeed favour binationalism. And some of these, with their policies favouring equal rights for Jews and Arabs, held a very prominent profile in western countries. But they had virtually no influence over debates among the Jews within Palestine (the Yishuv) at large. Even here, however, we find that some of the leaders of the Brit Shalom, such as David Werner Senator and Ya’acov Thon, ended up promoting “maximum” transfer. 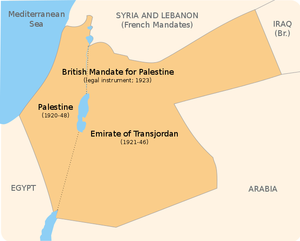 Revisionism: Advocated revision of the Mandate to include Transjordan as well as Palestine. Established by Vladimir Jabotinsky in 1925, it has always been known for its maximalist and uncompromising approach. Labor Zionism: Advocated a more pragmatic, gradualist and flexible approach to the “Arab problem”. Zionist colonization, even the most restricted, must either be terminated or carried out in defiance of the will of the native population. This colonization can, therefore, continue and develop only under the protection of a force independent of the local population — an iron wall which the native population cannot break through. This is, in toto, our policy towards the Arabs. To formulate it any other way would be hypocrisy. In this sense, there is no meaningful difference between our “militarists” and our “vegetarians.” One prefers an iron wall of Jewish bayonets, the other proposes an iron wall of British bayonets, the third proposes an agreement with Baghdad, and appears to be satisfied with Baghdad’s bayonets — a strane and somewhat risky taste — but we all applaud, day and night, the iron wall. For Jabotinsky, an agreement with the Palestinians as a prelude to a Jewish majority and Jewish state in Palestine, was neither possible nor desirable. Only an iron wall of armed garrisons would secure a Jewish claim on both sides of the Jordan River. We Jews, thank God, have nothing to do with the East….The Islamic soul must be broomed out of Eretz-Yisrael. 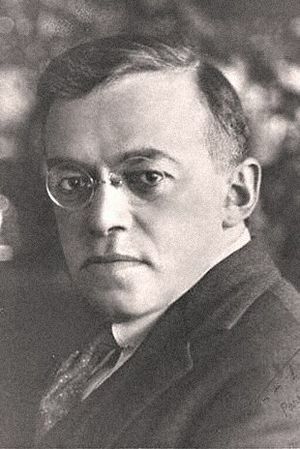 The Irgun Tzvai Leumi (IZL) was the first of two ideological offshoots of Jabotinsky-led Revisionism. The second was the Stern Gang. The Irgun was formed in 1935 as an underground military organization. In the 1940s it was commanded by Menahem Begin, later Prime Minister of Israel. The Lehi broke away from the IZL or Irgun in June 1940. It was founded by Avraham Stern, and later commanded by Yitzhak Shamir, another future Prime Minister of Israel. beasts of the desert, not a legitimate people . . . .
Stern’s original doctrine called not only for the “transfer” of the Palestinians, but also of all the Transjordanians, Syrians and Lebanese residing in those areas considered as belonging to “the Land of Israel”. Later, from 1944 to 1948, the Irgun launched attacks on the British. Lehi (Stern) specialized in political assassinations. Later, during the 1947-48 war, these campaigns intensified and played a significant role in the exodus of Palestinians from what became the State of Israel. Posted on 2010-07-25 18:15:31 GMT+0000 by Neil Godfrey. This entry was posted in Israel-Palestine and tagged Balfour Declaration, Masalha: Expulsion of the Palestinians, Palestine, Palestinian people, Zionism. Bookmark the permalink. Enjoyed this one. I had a friend that had a old magazine like “Time” from from like 1912 or some crazy old time, and some zionist was talking. Pretty scary stuff. You got the impression they didn’t consider the nomads of Palestine quite “human”. And I remember reading some part where the zionists would buy land from the nomads, with the nomands not really have any “property” understanding. They would sell the land, and then the zionists would put up fences, and the nomads couldn’t understand it. But were eventually booted off the land. Sounds like the USA and the indians. Perhaps the zionists could sell the palestinians some booze or blankets infested with small poxs. Few people realize that jews were pretty much the original group thinking they were the “master race”. It’s some totally crazy stuff. If I had my way, we would find some way to evacuate the people and make jeruselam radio active for 100,000 and anyone that went near it would grow two heads and drop dead. Most of the early “redemptions” or land sales were from absentee landlords. The Palestinians who had worked on the lands for generations and built their communities and lives around it over that time were suddenly evicted and left with nothing. The same racist descriptors are used of the Palestinians today as were used back in the nineteenth century. To excuse racist remarks on the grounds that their targets are “terrorists” also flies against the fact that Zionists were using the same language to describe them before terrorism as we know it began. The Zionist Jews are an anachronism. They are one of the last peoples to have clung to those old late-nineteenth century notions of racism and imperialism. They are still playing catch-up long after most other major players left the game in the ashes of Dresden and Hiroshima. As Gilad Atzmon has tried to point out, Zionist Jews are tribal. They have no measured grasp of the reality around them. Their arguments are still today about statistics and playing on fear; the Palestinian arguments are still today about daily life. The two will never meet. I hope to get through some more of the book and make the different chapters a more accessible online resource in the near future.